The importance of President Donald Trump’s recent meeting with North Korean dictator Kim Jong Un cannot be overstated. For the first time in history, a sitting U.S. President met face-to-face with the hermit nation’s leader. Not only that, the entire world at least temporarily spares itself the prospect of all-out nuclear war. But perhaps most significant to Trump, the Commander-in-Chief singlehandedly altered the calculus of U.S. foreign policy. No longer will our country engage the international community through absolutes. Instead, Trump demonstrated previously inconspicuous restraint. After months of taking potshots at Kim through social media, POTUS finally acted POTUS-like. That may be the most surprising element of the recent meeting. With this sudden shift toward rapprochement, President Trump may have secured his reelection. Still, significant challenges remain. According to CNN’s Stephen Collinson, the two nations’ joint declaration offered only a “tepid commitment” to North Korean denuclearization. Moreover, political analysts fear that Trump gave up too much in putting a halt to U.S.-South Korean military drills. And let’s be real: Kim Jong Un isn’t exactly a poster child for trust and transparency. Prior to the landmark meeting the two leaders, several South Korean companies had fallen under significant pressure. Evidently, threats of thermonuclear war, and a massive blitzkrieg of enemy troops invading your capital city isn’t great for business. SK Telecom Co Ltd (ADR) (NYSE:SKM) discovered this the hard way. Although SKM stock experienced a surge in market value in the final quarter of 2017, it quickly disintegrated from late-January onward. This occurred while President Trump accused Russia of secretly aiding North Korea, allowing the dictatorship to avoid international sanctions. On a year-to-date basis, SKM is down 10%. However, this metric is deceptive because SKM stock jumped nearly 5% ahead of the Trump-Kim meeting. More importantly, the move puts an end to an ugly bearish trend channel that’s been in place since early February. Moving forward, the positive vibes from the meeting should boost South Korea’s consumer economy, and by logical deduction, SKM stock. Last year in April, I had a dim view on Korea Electric Power Corporation (ADR) (NYSE:KEP). Korea Electric is the granddaddy of all utility companies in South Korea. As a result, KEP stock provided strong gains over the past few years. And at the time, the company offered a generous 7% dividend yield. My, how threats of nuclear warfare change investor sentiment! I warned readers about KEP stock when Kim Jong Un was solely regarded as a madman with an itchy trigger-finger. Since writing about the company, shares have fallen almost 17%. Perhaps even worse, those lofty dividends dropped down to a decidedly less generous 2.3%. With the situation having performed a 360, KEP looks attractive as one of the speculative Korean stocks to buy. First, shares are trading at steep discounts at levels not seen since early 2014. Second, the Korean economy has some assurances that President Trump will exhaust all non-military options before entertaining confrontational measures. Don’t get me wrong: KEP stock is still very risky. But if you’ve got the nerve, Korea Electric looks very interesting right now. Telecommunications company KT Corp (ADR) (NYSE:KT) was a victim of poor geopolitical timing. Since fiscal 2015, management embarked on a recovery strategy. Generally speaking, the strategy was a success. KT Corp pulled together three consecutive years of sales growth. Unfortunately, the leader Trump once referred to as “rocket man” ruined everything. At the end of March 2017, KT stock was up over 19% for the year. In late April, I expressed my concerns about the company. Admittedly, I was premature in my bearishness as shares went on to gain more than 15%. However, in late summer, KT tumbled badly. Since my article’s publication date, the telecom giant lost nearly 12%. But like other Korean companies, that calculus changes dramatically if President Trump and North Korea strike a peace deal. Granted, we’re a long ways off from that. Still, we’ve no doubt made previously unimaginable progress. If I were a gambling man, I’d put KT Corp on my long-term stocks to buy list. Metals and mining firm Posco (ADR) (NYSE:PKX) was one of the Korean companies that I did not call correctly. At the time, I felt the inherent volatility of this sector combined with the threats of a nuclear-armed madman was enough to do in PKX stock. I erred badly. Not only did Posco completely ignore the threats, it did so with much aplomb. For 2017, it ended the year up over 47%. The mistake I made was that the other Korean firms I featured depended on their national economy and consumer sentiment. I conflated that concept with my forecast for Posco. However, Posco has an international consumer base and is, therefore, less vulnerable to the Korean economy. With that being the case, PKX stock should continue to enjoy bullish trading activity. Since its January opener, Posco is up a little over 4%. This isn’t a mind-blowing return by any stretch of the imagination, but it demonstrates the firm’s stability under pressure. When people think about Korean companies, Samsung often comes to mind. But according to this year’s Harris Poll, LG Display Co Ltd. (ADR) (NYSE:LPL) ranked 25th according to a reputation metric. This ranking is based on graded attributes, such as “emotional appeal” and financial performance. LG’s rival Samsung came in at 35th place. But as far as LG stock is concerned, reputation means nothing. Last year, the OLED-TV maker produced a pedestrian performance in the markets, gaining only 4.6%. This year, the North Korean missile crisis apparently reared its ugly head for the company. LG shares hemorrhaged more than 25% in equity value. Understandably, such steep losses have freaked out most investors. However, I consider LG stock a speculative, but ultimately smart, gamble. Thanks to a U.S. administration willing to think outside the box and challenge the political old guard, we have not unreasonable confidence towards a meaningful solution. With the dark cloud gone for now, LG Display can concentrate on what it does best: supplying the world with low-cost, high-quality TVs. As the leader in financial services in Korea, KB Financial Group, Inc. (ADR) (NYSE:KB) appeared the most at risk for a pullback. Being so close to both conventional and nuclear weaponry, and a person threatening to use them, KB Financial was in a no-win situation. At least, that was the conventional thinking at the time. But last year, KB stock was one of the best performers in the markets, hauling in an incredible 62%. If Kim Jong Un was menacing his southern neighbor, KB Financial didn’t blink at all. That dynamic changed dramatically for the worse this year despite thawing relations between North and South Koreas. Since January’s opening price, KB stock dropped more than 12%. That said, this month looks promising, with shares up 6.5%. The unprecedented meeting between Trump and Kim also stopped an ugly, bearish trend channel. Should geopolitical progress continue, look for KB stock to enjoy a meaningful recovery. Like its compatriot rival KB Financial, Shinhan Financial Group Co., Ltd. (ADR) (NYSE:SHG) enjoyed a strong showing in 2017. Despite nuclear-weapons testing and constant muscle-flexing from the North, SHG stock delivered over 20% returns. Those hoping for a repeat performance were quickly rewarded in January. Unfortunately, the optimism didn’t last long. Starting in February, SHG stock absorbed a near-vertical decline, punctuated only briefly by South Korea hosting the Winter Olympics. After the quadrennial tournament ended, the selloff resumed. As a result, shares are down more than 6% YTD. However, under the geopolitical context, I believe now is a great opportunity to strike. Many investors ignore the company’s solid financials. Both revenue and net income have been steadily rising over the past four years. Not only that, we’re seeing a huge increase recently in non-interest income. Rising non-interest income suggests that Korean clients are borrowing money and seeking other financial services. It’s a real-time indicator that individual citizens are optimistic about the future. This, in turn, justifies putting SHG in your stocks to buy list. Woori Bank (ADR) (NYSE:WF) is another Korean institution that appeared unfazed with Kim Jong Un’s incessant threats to global stability. Last year, WF stock gained nearly 41% for shareholders. Even more impressive, most of the bullishness occurred between the spring to the middle of summer. This was when North Korea continued to sink to new political lows. However, events started to catch up with Woori Bank from last August. Despite some substantive rallies this year, the overall trading for WF stock was extremely volatile. And really, who could blame market participants? Americans didn’t really have much confidence in their President. Plus, a face-off involving Trump and Kim appeared both inevitable and disastrous. The calculus has now changed, and investors are free to buy up WF stock. Without the unnecessary drama, we can focus on what matters: revenue and net income growth, which has been impressive over the past three years. To be fair, I would have liked to see more from its last quarterly report. That said, the unexpectedly positive geopolitical undertone makes WF stock a compelling bet. Technically an exchange-traded fund, I’m nevertheless going to put iShares MSCI South Korea Index Fund(ETF) (NYSEARCA:EWY) on my stocks to buy list. With an ETF, you don’t have to expose yourself to any one name. That’s incredibly attractive, especially for Korea-based investments. Even though the Trump-Kim meeting provides encouragement, we’re not out of the woods yet. Just as importantly, the EWY offers significant exposure to the strongest Korean stocks to buy. The fund’s biggest holding is Samsung, with a 21.2% weighting. Next is powerhouse memory chipmaker SK Hynix Inc, followed by Posco and KB Financial. Thus, if anyone of these top-players underperforms, the other names could pick up the slack. Finally, the EWY provides exposure to Korean companies that aren’t readily available to American investors. Samsung is a great example. So too is Hyundai Motor Co, which is only traded in the Korean markets. The Washington Post’s Callum Borchers considers all the G-7 nations losers from the Trump-Kim meeting. Agree or disagree, Borchers utilizes sound logic. With the President mentally preoccupied with the then-upcoming sit-down, he didn’t bring his A-game. Apparently, Trump complained to his aides about wasting time speaking with the G-7 allies. Among those unrequited partners was Japan. However, it’s hard for me to call the Japanese leadership losers from this historic (and controversial) event. North Korea was routinely launching missiles over Japanese territory. Now, that must stop if a true peace deal is to work. Furthermore, the country’s Prime Minister Shinzo Abe didn’t lose face in the meeting; if anything, Trump did. That’s why I like Japanese stocks to buy, and in particular, Mitsubishi UFJ Financial Group Inc (ADR) (NYSE:MUFG). As one of the world’s biggest banks, Mitsubishi UFJ carries significant clout. Furthermore, MUFG stock has tanked this year, shedding more than 16%. But coincidentally, we’re seeing a slowdown in the volatility. With the positive vibes from the U.S.-North Korea talks, I’d take a shot at MUFG stock. The Japanese are not stupid. That’s essentially the message that Prime Minister Abe sent the world earlier this year. While Abe expressed optimism towards his counterparts in the U.S. and South Korea making diplomatic overtures to Kim Jong Un, he appears the only leader that understands duplicitous North Korea. Abe bluntly stated, “Talks for the sake of talks are meaningless.” Note that Kim scored two high-profile meetings: first with South Korea’s President Moon Jae-in, and later, President Trump. The third time (with Abe) is probably not the charm. Japan has preconditions to a North Korea summit, which includes a resolution to the rogue nation’s abducting Japanese citizens. In my opinion, it’s Abe who is acting more Reagan-esque; remember “trust, but verify?” This both eyes open approach makes Mitsubishi Corp/S ADR (OTCMKTS:MSBHY) an enticing opportunity. It’s clear as daylight that Japan needs to rearm to the teeth. Therefore, Mitsubishi’s defense and aerospace division looks to enjoy unprecedented demand. Kawasaki Heavy Industries Ltd (ADR) (OTCMKTS:KWHIY) is a thinly-traded company. KWHIY stock has also experienced significant volatility this year. After soaring to multi-year highs in January, shares quickly tanked. Against its January opener, KWHIY is down nearly 13%. So why on earth am I putting Kawasaki on my stocks to buy list? Again, it goes back to Prime Minister Abe’s hawkish stance on Kim Jong Un and North Korea. While other leaders apparently have rose-tinted glasses with Kim, Abe made it clear that he doesn’t trust the hermit nation. He’ll play the diplomatic game as he always does, but he’s also drawn a line in the sand. Japan won’t negotiate without preconditions. That just makes Kawasaki’s defense and security business all the more critical, irrespective of nearer-term troubles impacting KWHIY stock. Right now, everyone is hoping for the best. However, Abe knows that optimism without a backup plan is political suicide. In other words, KWHIY stock will move higher sooner or later. If the Japanese government has learned anything about the Trump administration, it’s that the U.S. is not a reliable ally. While the sit-down with North Korea catalyzes a realistic path to a peace deal, we also have a different angle: North Korea never faced consequences for its repeated violations of international law. That is certainly going to be a sticking point in future talks as far as Japan is concerned. As a result, I’m extremely bullish on Japanese defense stocks to buy. One obscure name that could command significant profits is Daikin Industries, Ltd. (ADR) (OTCMKTS:DKILY). Specializing in precision machining technology, Daikin utilizes its expertise to manufacture ammunition and warheads, along with other defense-related products. The company also produces aircraft parts, and avionic-safety mechanisms. So far, DKILY stock has only produced pedestrian results, gaining a mere 2.6% YTD. But with geopolitical undercurrents forcing more funds into Japan’s defense industry, I’d give Daikin a long, hard look. During the 2016 campaign trail, Donald Trump routinely targeted Komatsu Ltd (ADR) (OTCMKTS:KMTUY). Known worldwide as a heavy-industries equipment provider, Trump bitterly complained that Japan manipulated its currency. As a result, Komatsu was able to undercut the competition, thereby hurting American companies. But in a weird twist, both real-estate mogul and POTUS Trump demanded that Japan do more to protect itself. Thus, Trump shouldn’t have been too hard on Komatsu. While the Bank of Japan’s quantitative easing program isn’t necessarily favorable for American companies, Komatsu is actually a “pro-Trump company.” Thanks to its lesser-known defense division, KMTUY is helping Japan’s military do more — just what Trump wanted. And yes, I believe that the North Korea situation provides perfect cover for Japan’s defense industry. But more importantly, the island nation’s government wants to counterbalance China’s growing influence in Asia. Given this heightened environment, you’re going to see KMTUY stock move up one way or another. I hate to say it because it sounds incredibly unpatriotic. However, I’m just being completely honest: while President Trump probably won himself reelection, the U.S. was the biggest loser in the North Korea rapprochement. Before you inundate me with angry emails, consider what just happened. For years, our country maintained that we will not negotiate with terrorists. Now, the message is that we’ll negotiate if those terrorists have nuclear weapons. Through unrepentant intimidation tactics, Kim Jong Un got exactly what he wanted: legitimacy on the world stage. Several political analysts questioned Trump that he gave up too much and got little in return. The biggest sticking point is that the President agreed to suspend joint-military activities with South Korea. The U.S. cannot afford to look weak at a time like this. Therefore, you can confidently place Lockheed Martin Corporation (NYSE:LMT) on your stocks to buy list. Our security forces and exercises don’t exist just to keep North Korea in check; we also have regional adversaries in China and Russia. While LMT stock hasn’t performed so well this year, I expect that to change over the next few months. Following talks between President Trump and Kim Jong Un, defense contractor Raytheon Company (NYSE:RTN) absorbed nearly a 3% decline. I understand the markets’ reasoning. If the U.S. is serious about peace in the Korean peninsula, demand for RTN stock will fade. Not only that, those war games that Trump allegedly gave up represented an excellent showpiece for Raytheon. But while I understand the markets, that doesn’t mean I agree with their consensus take. Yes, in the immediate timeframe, the situation doesn’t look ideal for defense contractors. If you’re day-trading RTN stock, I sympathize with the need to reduce exposure. However, if you’re looking at this long term, I can’t help but think RTN is a solid buy. Here’s why I say that: North Korea isn’t done playing games. This is a country that’s always pushing to see what they can get away with. Reducing our military presence and our preparedness would not only be stupid, but borderline treasonous. I don’t see any scenario, especially with a Republican President, in which we give up our presence in Korea altogether. Preventing armed conflict is always a good thing. That said, Trump’s meeting with the North Korean leadership raises a new, thorny issue. If your threats are big enough and you have the ability to carry them through, the U.S. will negotiate. While we’re not going to see the impact of this immediately, undoubtedly, our enemies have taken notice. Today, our problem is North Korea. Tomorrow, our problem will be North Korea secretly sending their nuclear technology to other rogue states or terrorist organizations. Countering the next generation of threats will require defense solutions that go beyond traditional applications. This is why I like Kratos Defense & Security Solutions, Inc (NASDAQ:KTOS), which specializes in advanced warfare and security solutions. In particular, I’m bullish on their unmanned aerial systems, as well as their aerial target services. While we can’t ignore our conventional military options, our greatest threats are asymmetric: lone wolves or small terror groups where large-scale weapons are ineffective. KTOS provides our military forces with next-level technologies that can better address these asymmetric threats. Trump-Kim Summit: JPMorgan Chase & Co. If the North Korea situation works out like Trump envisions, he’s going to win in 2020. Even if nothing substantive comes about, so long as we avoid armed conflict, you have to like Trump’s chances. After all, the President will simply ask his opponent, what have you done for our country lately? I realize this is something that many Americans don’t want to hear right now. With that said, one sector stands to win bigly if Trump pulls off four more years: financials. Unbelievably, unemployment is at multi-year record lows, while the markets have generally responded positively to the administration. Despite all the political jockeying, the economy loves stability. Such consistency only benefits companies like JPMorgan Chase & Co. (NYSE:JPM). Yes, I’m sure that JPMorgan’s management team would prefer a Democrat or any besides Trump in the White House. Still, they’re business people first, and politicians second. Nobody can refute that Trump has enjoyed surprising success for a political novice, especially in the economic realm. It’s imperfect, but at least JPM will know what they’re getting with Trump. Last month, I warned readers about Caterpillar Inc. (NYSE:CAT). Despite putting up strong numbers for its first quarter earnings report, CAT stock took a good-sized beating. Several analysts thought the selloff was confusing because the performance was outstanding. Furthermore, the guidance was bearish, but experts had expected this. I argued, though, that bears were right to jump ship on CAT stock, in part because the construction industry is disappointing this year. I must step back from my initial bearishness, and not just because I was wrong about the price trajectory. What I witnessed earlier this week was a remarkable paradigm shift. We haven’t had normal relations with North Korea for over six decades. Not even halfway through his first term, President Trump could pull of the impossible. If he does, any construction industry weakness is a walk in the park. Considering that Caterpillar is one of Trump’s favorite companies, I was short-sighted in my pessimism. I’ve long criticized Twitter Inc (NYSE:TWTR) so it’s difficult for me to avoid bias. I think its subscriber growth rate is unimpressive for a relatively young company. The financials are ho-hum, especially considering that it’s just now making money. Finally, I can do without Twitter CEO Jack Dorsey playing the suit-and-tie version of Shohei Ohtani. Because Dorsey could just as well experience the suit-and-tie version of a grade two UCL sprain. That said, I can’t deny that TWTR stock has exceeded all expectations. This year, shares are up more than 81%. The turnaround is for real, and Trump is a big part of it. Look at what happened after his meeting with Kim Jong Un. TWTR stock jumped 5%, and then inched higher the following day. Investors are especially enthused because we’re witnessing paradigm-shattering history playing out in a social media platform. I can’t explain it, and I’m not going to pretend I understand it. But Donald Trump has the Midas touch, and TWTR stock is on the receiving end. 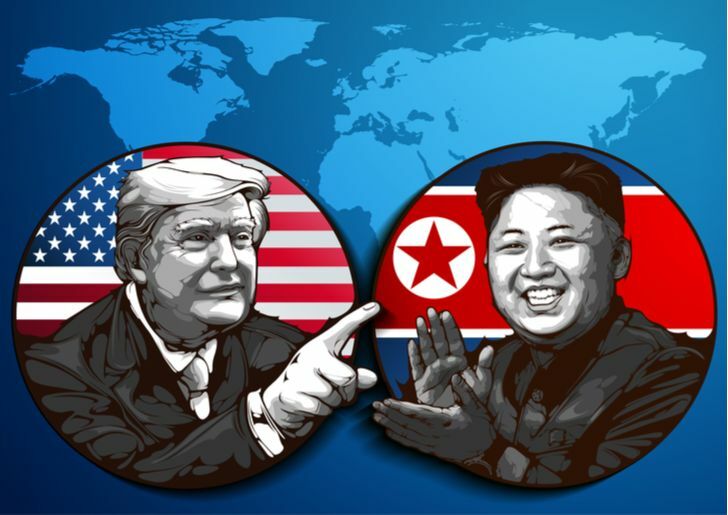 Article printed from InvestorPlace Media, https://investorplace.com/2018/06/20-stocks-with-renewed-bull-cases-after-trump-kim-summit/.